At IIM-A, the dominant pedagogical tool was the case study, a device that utilizes real-life situations for instruction. In writing his early case studies at IIM-A, LRB relied on experiences in his own professional and personal life. His first case-study, entitled "Consumer Products Ltd." was written while he was still at Hindustan Lever and was co-authored with his colleague and friend at HLL, Diwan Arun Nanda. It is based on his own experience of managing Surf and tackles the problem of countering a competitor's successful promotional campaign. In this post, we examine this case study as a historical document and, with the help of the print advertising record and the testimony of his colleagues and friends, attempt to reconstruct the events that it is based on. In July 1969 LRB, not yet 21 years old, was promoted to the position of Product Manager in the washing products group at Hindustan Lever. With this, he took over profit responsibility for the Surf detergent powder brand from his boss, BA Vatsal who was busy developing a new product - the RIN detergent bar. The washing products group was a major profit centre for HLL, indeed its most valuable profit centre contributing 70% of the company's revenue and 80% of its profits. And Surf was one of the company's most important brands. It was an important assignment. A year later, impressed by his performance, HLL's marketing director David Webb would promote him, out-of-turn, to the envy of his seniors. We trace that one year - July 1969 to June 1970 - in LRB's professional life. "The fabric washing market consisted mainly of two product groups: washing soaps and washing powders (detergents). Small-scale units operating in very small, localized areas contributed more than three-fourths of the washing soap. These small-scale manufacturers did not have any national distribution, and their products were generally sold within a radius of 100 miles of the plant location. On the other hand, the production of washing powders (detergents) required greater technical know-how and was located entirely in the organized large-scale sector of the industry. Although the size of the washing powder market was one-tenth of the washing soap market, it compared favorably in profitability because of its higher margins. The use of washing powders was restricted to the urban population, and within the urban population it was concentrated in large towns. The potential for growth of washing powders was high in small towns; at the same time, the market in larger towns was highly competitive. Difficulties of distribution and the high cost of going to the smaller towns did not allow the manufacturers of washing products to employ their own distribution system in these towns. That left the transportation of stocks to the smaller markets to the wholesale trade channel." The washing powders (detergents) market in India was created in 1956-57 when a company called Swastik Oil Mills, owned by the Ambalal Sarabhai family, launched a white detergent called 'Det' that soon became popular in eastern India. HLL followed suit with the blue Surf which, thanks to their deep pockets, marketing knowhow and extensive network of well-trained salespersons, quickly established itself as the market leader in the rest of the country. Swastik launched another, cheaper detergent called Sway which it sold in bulk tins of 2 kg size. The large blue tins that Sway was sold in were often recycled to be used as kitchen containers, leaving lasting imprints in the memories of people who grew up in those years. In 1966, Tata Oil Mills Company (TOMCO) launched 'Magic', taking some share away from both HLL and Swastik. By the beginning of 1969, these four products - Surf, Det, Magic and Sway accounted for over 95% of the market. Surf was way ahead with 75-80% of the marketshare, Magic with 10%, Det with 7-8% and Sway with 3-4%. Swastik (which was, by then, being managed by Dr. Vikram Sarabhai) wanted to challenge HLL's dominant position in this market. However, this was easier said than done. As things stood, neither Det nor Sway could meaningfully compete with Surf because, with its much bigger marketshare and revenue, HLL outspent them by about 7 times in advertising for Surf. Unless Swastik managed to quickly and significantly increase their marketshare, they would not have the revenue to sustainably finance a meaningful level of advertising to challenge Surf's dominant position. Therefore, the first step was to increase sales through a low-cost promotion so that a higher advertising budget could be made available to compete with Surf. Swastik set itself an ambitious target. They aimed to increase their combined marketshare from 10-12% to about 25%. For this purpose, Swastik chose Sway (marketshare of 3-4%) instead of the more popular Det (marketshare of 7-8%). Sway was the cheapest powder in the market and therefore had the highest margins after variable cost (Rs. 1600/tonne compared to Rs. 1000-1100/tonne for the other three products). Therefore, all things being equal, a jump in sales of Sway would translate into a bigger war chest for future marketing support than a similar jump in Det sales could. Moreover, the company had recently improved Sway's formulation and launched it in two smaller-sized carton packs of 700 gm and 200 gm just like Surf. It was also blue, like Surf, making it that much harder for consumers to differentiate the different quality of the powders inside. 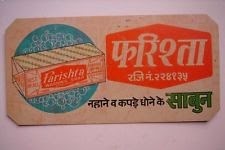 The time was ripe and, so, in the beginning of 1969, Swastik decided to execute their plan by launching a very attractive promotion for their 700 gm pack. And thus began India's first detergent war. Swastik started printing gift coupons with serial numbers on its 700 gm cartons. Consumers were informed, through a concomitant advertising campaign, that if they collected 6 such packets of Sway, they could exchange them in-store for a free plastic bucket. It was a generous promotion. Plastic buckets had only recently become available in India and were widely perceived as preferable to the traditional, galvanized-tin alternative. They were also more expensive, selling in the market for Rs. 6, almost twice as much as the traditional alternative (a packet of Surf, for comparison, cost Rs. 4.50). A bucket also represented a modern, improved, less tiring washing method - soaking instead of scrubbing - that all detergent manufacturers, and especially HLL, had been evangelizing through demonstrations. Buying a bucket meant an extra expense, however, and thus, the opportunity to obtain a bucket for free was very attractive. The requirement to collect 6 packs over three months also meant that for consumers who decided to go for the promotion, their purchases would represent all their detergent needs for about 3-4 months. As a result, at least for those three months, they would switch from a competitor's product, likely Surf, and remain loyal to Sway. In addition, though the bucket cost Rs. 6 in the market, Swastik could negotiate deep discounts because of their bulk order. And, as the the bucket was being offered free, there would be no additional retailer's margin. In essence, the retailers were subsidizing the promotion by stocking the buckets without charge. The promotional offer took competitors, and especially HLL, completely by surprise and they were caught off-guard. 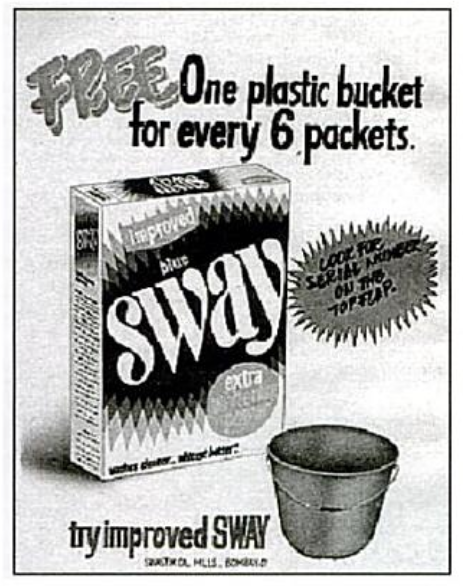 Initially, they dismissed Sway as an inferior product that wouldn't work, and expected that the need to purchase 6 packets would deter consumers. Over the next three months, however, with the help of the promotion, Sway made major gains in the market. By the end of the first month, Sway's marketshare had jumped from 3-4% to 10%. By the end of four months, it had further shot up to 20%. The huge increase was mainly at the expense of Surf. The case-study gives us a flavor of the reaction inside HLL at various levels through a set of representative (though probably imaginary) conversations. It doesn't name the individuals, only their positions. But, by talking to people who worked at HLL at the time, we have been able to put names to those conversations. The first such conversation is between the energetic David Webb, then the Marketing Director and JC Chopra, the Marketing Controller. It shows HLL management's growing concern at their dropping marketshare and an acceptance of the fact that they had a problem at hand. David Webb (Marketing Director): Well, having looked at the marketshare figures up to July and the various reports of the success of Sway, what do you propose we do? JC Chopra (Marketing Controller): I have thought over this problem. Despite our initial feeling that Sway would be a failure, we now see that it is doing very well. If they carry on at this rate, they will certainly be a major threat to our marketshare. They can afford such heavy promotion due to their cheaper formulation. I personally feel, that we should, as soon as possible, introduce a second brand which would have an inferior formulation but equal to Sway. This new product should be heavily consumer promoted at about the same level of expenditure on promotions due to the higher margins we will make if sold at a price equal to Surf and Sway. Alternatively the product can be sold at a lower price than Sway. David Webb: That is certainly an alternative we must consider. I suggest that we start working on this straight away and meanwhile we could have a full scale meeting of our entire marketing team and try to decide the course of action that we must take to bring back our marketshare to its original level. The second conversation is between Bhau (KS) Phansalkar, who was then the General Sales Manager of Soaps and Detergents, and a regional Sales Manager. It betrays urgency and some panic amongst the sales force and a strong feeling that the only way out of this situation is for HLL to counter with a similar promotion. Bhau Phansalkar (General Sales Manager): What is the situation of washing powders in your area? Sales Manager: Sway is making heavy inroads into our sales with their new pack. In the past, with the bulk pack, this brand represented an insignificant part of the market. The main reason for their success is the very generous consumer offer they have run. At this rate, we will have to come down on our sales estimates. I am not sure I will be able to meet my target. Bhau Phansalkar: Well, you see, due to their inferior formulation and a higher margin, they can afford to spend more than we can on consumer promotions. But our product is definitely superior and we should be able to win back our marketshare. Sales Manager: Consumer promotion is a very effective sales medium to the retail stores and the consumers. I am afraid if they continue at this rate, we will find it very difficult to keep pressure on our sales and achieve our estimates. We must counter immediately with a promotion as heavy as their or we would lose out. Bhau Phansalkar: Well, then your recommendation seems to be that we enter the rat race and promote Surf heavily to the consumer. Are we sure we cannot get away with offering less due to our better product, giving promotions like we have in the past. Sales Manager: I am convinced that unless we step up our expenditure per tonne to the level that Sway is spending, we will not be able to sell our product. By the end of July, it was clear that there was an 'urgent need to act'. It was clear that HLL would have to counter this onslaught. There was a growing belief amongst the sales force and some of the marketing managers that HLL should counter with a similar high-value promotion. But how? Sway's lower cost and higher margin meant that they had an extra Rs. 600/tonne that could be used for the promotion. Indeed, HLL calculated that Swastik must be spending close to Rs. 700/tonne for the bucket promotion. Given that Swastik started with a very low marketshare, any money they were spending on the promotion would give them new customers. On the other hand, even in July, HLL still had a 68% market share. If they offered a similar promotion, most of the money they would spend on the offer would end up subsidizing a large number of their existing customers (essentially giving them a free bucket) and only a small proportion would go towards wresting back those that switched to Sway. In other words, the same promotion would be much more expensive for HLL than it had been for Swastik. As a result, they would take a hit on profits in the process of regaining their marketshare. Moreover, once HLL got into the game, it would be a vicious cycle, where consumers may begin to expect such offers (or a lower price), thus reducing profitability in the longer-term. A meeting at HLL. LRB is second the left. 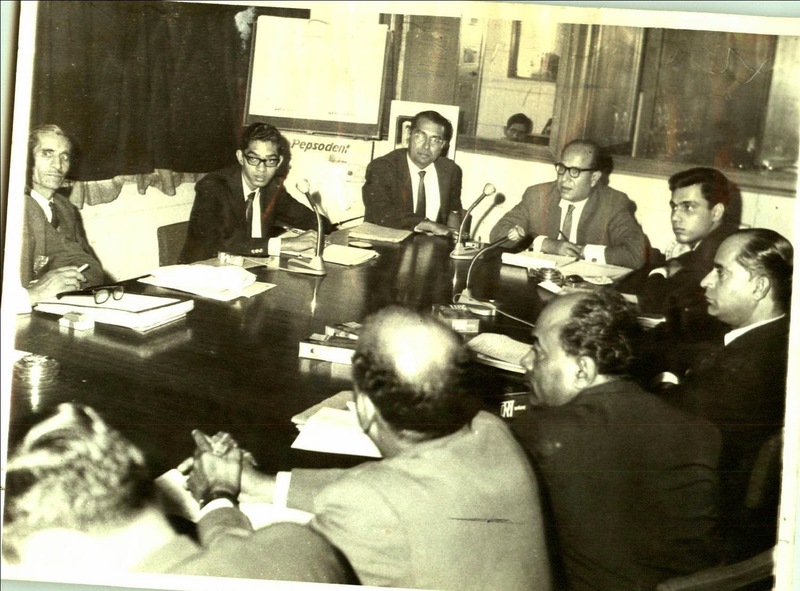 Diwan Arun Nanda is 5th from the left. LRB had grasped this, and took a contrarian view - that HLL should not counter with a similar, high-value promotion. On the contrary, they should put whatever money they could into advertising the superior quality of Surf. The case-study provides us with another conversation, this time between LRB and Diwan Arun Nanda, the two co-authors. Diwan Arun Nanda was the promotions manager, who was responsible for planning and executing the advertising and consumer promotion campaigns to meet the marketing strategy that the management came up with. He was the one who would work with Lintas and other agencies to get the ads made and work with other parties to get them shown. LRB, on the other hand, as Product Manager for Surf was responsible for its profits and therefore decided what the budget for advertising and promotions would be, and therefore had a say on what the money was used for. Both LRB and DAN were good friends, both having graduated from IIM-A from the 2nd and the 1st batch respectively. In this conversation, both of them express two differing views about what should be done to counter Sway's growth. Diwan Arun Nanda (Promotions Manager): Labdhi, I have come to discuss the results of the consumer promotion that Sway has run for the last four months. Their promotion has certainly been an outstanding success as one can see from the marketshare figures as well as the reports we have received from our sales management throughout the country. I would like, immediately, to get an additional budget for promotion and promote Surf at about the same level as Sway to win back our marketshare. Being better organized, we should be able to mount more effective promotions than theirs, but ultimately the gift should be as attractive to the consumer as the gift that Sway is giving away and this will mean about the same level of expenditure. For this I feel you should cut down on your theme advertising for Surf and divert some of this money to promotions straight away. Labdhi Bhandari (Product Manager): Arun, I don't agree with you here. I feel that we should not indulge in such heavy promotional expenditure as Sway has done because this will get us into a vicious cycle. We have been selling Surf on the basis of its superior formulation and performance. This fact should be highlighted now more strongly and sharply through heavier theme advertising. We should put as much of our money as we can into theme advertising to convince the customer that when she buys Sway with gifts of such high value, she does so by settling for an inferior product. For this, I would like to place all my money in press, cinema, and point-of-sale material. Diwan Arun Nanda: Labdhi, the reach of the media in the country, as you well know, is very limited. Apart from point-of-sale material which can be put up in all places, you can only cover a very small fraction of your total target through press and cinema. If, for instance, we had TV as widely as one does abroad, your point would make sense as the target consumers could be reached through theme media. But looking at the difficulties and the inadequate reach of the media in this country, it is essential that we consumer-promote heavily in order to win back what we have lost. Unless we do this, we will be on the losing end and Sway would do well mainly at our expense, we being the biggest brand in the market. We should, and I insist that we must, start consumer promoting Surf at the same level as Sway as soon as possible. The case-study ends, as it is meant to, at this point. It does not tell us what LRB, DAN and the rest of HLL's marketing management decided to do in the end. In future years, students at IIM-A would have to step into the shoes of LRB and DAN, and come up with a strategy that would pass muster of their sharp teachers, including LRB. They would usually start by suggesting the strategy of countering with a similar promotion. Sometimes, someone would make the mistake of suggesting, that HLL offer something 'bigger', and end up earning a sarcastic put-down from LRB: "Like a bathroom, for instance?" In the classroom, LRB would lead the discussion to the realization that while Surf had lost marketshare, it had not lost sales. Swastik's promotion had brought in new consumers of detergents, likely only for the short-term, and they had swelled Sway's marketshare. Gaurav Shinghal, PGP '82, remembered that when a fellow student put forth a strategy that involved winning marketshare at the cost of lower profits, LRB, in his typical style, would take this line of reasoning to its absurd logical conclusion: "So, in the share-holder's meeting, the company will announce that they had done a fabulous job of increasing marketshare. This has led to a drop in profits. 'So, this year share-holders, we will be distributing marketshare instead of dividends.'" From this indirect evidence, we can probably hazard a guess what LRB did in 1969. To find out what actually happened, we need to turn to the historical record and the testimony of witnesses. One good way to find out what happened is to look at the advertising from the time. While its no longer easy (or even possible) to find point-of-sale material or cinema ads, we can look for print advertisements in newspaper archives. 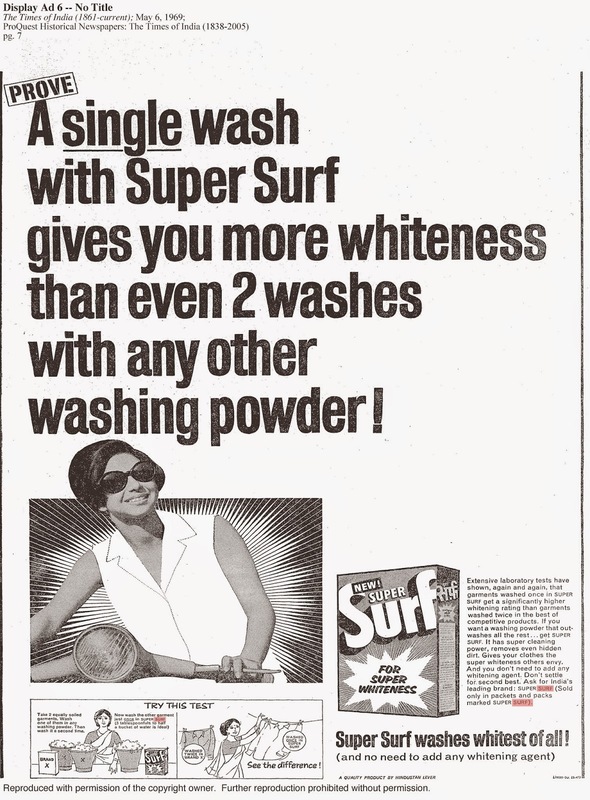 We carefully combed through the Times of India Bombay editions from 1969 and 1970 to find all the Surf advertisements that appeared in the period. There were essentially two Surf ads that we found. One took a completely rational approach in an elaborate presentation with the following message: ONE wash with Surf was better than TWO with any other washing powder. Laboratory tests were emphasized and customers were encouraged to try out an experiment and prove this fact for themselves. Indeed, the ad was almost presented like a theorem to be proved by the consumers through their own experience, with a step-by-step graphic to boot. This was essentially the 'strong and sharp' message about Surf's superior formulation that LRB was arguing for. The second ad presented a consumer promotion. It offered an 'attractive serving tray from Metal Box' in exchange for three red gift coupons which could be obtained from the economy packs (700 gm) of Surf. This was more akin to the kind of promotion that DAN and the sales force was arguing for, though, 45 years later its hard to judge how 'attractive' this offer would have been for the target consumers in that era. Indeed, the advertisement itself appears hesitant, clarifying that, in fact, Surf's best gift was its superior washing power. This offer was only available in Delhi and Bombay, the main big-city markets and this promotion announcement appeared only twice in the Times of India that year, compared to the rational 1-wash-whiter-than-2-washes theme, which appeared much more frequently. In the end, the advertising record suggests that LRB must have won over the marketing management to his point of view. Most of HLL's Surf advertising spend seems to have gone into 'stronger and sharper' theme advertising highlighting Surf's superior formulation. Another kind of historical record are the media reports of the time and later. They do not seem to have taken much notice of this detergent war bar one oft-told story that did emerge. Journalists reported a cheeky tactic that HLL used to put a spanner in Sway's promotion. Apparently, HLL made a list of all the plastic manufacturers and bought their stocks of plastic buckets, thus choking up their supply. Swastik was then unable to fulfill its promotional offer because buckets were simply not available. This, the story goes, led to consumer disillusionment and the decline of the promotion. Given that it has been over 45 years, witnesses are hard to find. Many of the key principals are no longer alive: LRB, BA Vatsal, David Webb have all passed away. Siddharth 'Shunu' Sen, a key member of the marketing management at HLL has also passed away. We are still waiting for a chance to speak to Bhau Phansalkar, JC Chopra and Diwan Arun Nanda. One witness who we did speak to is Hrishikesh Bhattacharyya, a close friend and colleague of LRB at HLL, and the person who would become product manager of Surf later, in 1972. He confirms our earlier suspicion that their first strategy was to try and regain Surf's marketshare by increasing advertising spend with a new, more competitive campaign (though he did not remember the consumer promotion with the tray). Mr. Bhattacharyya also tells us, interestingly, that this approach did not work in the end. LRB's friend, Amar Chakravarty, who took over from him in July 1970 would then try the other strategy, launching a series of high-value promotions. That strategy did win back marketshare, but at a higher cost per tonne. By the time Mr. Bhattacharyya took over as Surf's product manager in 1972, they would settle on a mix of promotions and advertising spends. Soon, though, Karsanbhai Patel's Nirma, which had started in 1969, started impacting the market. Eventually, Sway would disappear and a new set of detergent wars would begin between Surf and Nirma. *This note was prepared by Apoorva Bhandari based on a number of historical documents: Consumer Products Ltd. (originally called Household Products Ltd.), a case study co-authored by LRB and Diwan Arun Nanda in 1970, a case-study on the Sway promotion authored by P. Choudhury in a book called Succesful Sales Promotions, the historical archive of the Times of India (Bombay edition) and archives of the Business India magazine. It also relies on the testimony of Hrishikesh Bhattacharyya, and the students of PGP '82.